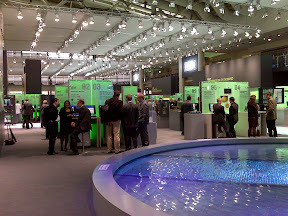 Ok - here is the IBM booth, it's one of the biggest, SAP has probably a similar size booth but not as trendy. 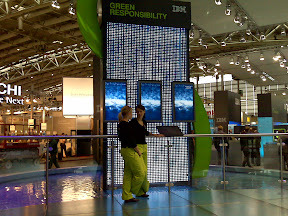 Green is big in Europe, companies are messaging they care about the environment. MS' Steve Ballmer even mentioned it in his keynote, that MS is greener with Vista than it was with XP, with it reduced power consumption etc. Ok now what about the food! 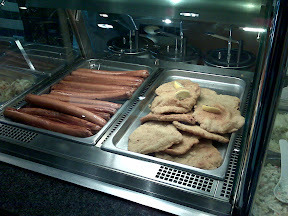 Here you go - So on the left hand side is the typical sausages they can serve with sauce, and on the right hand side is pork with breadcrumbs(or what seems to be).